New Zealand 9-209 (James Franklin 47*, BJ Watling 45, Ryan McLaren 4-46) beat South Africa 208 (Faf du Plessis 57, Ryan McLaren 33, Mitchell McClenaghan 4-20) by one wicket. The Proteas were bowled out for 208 runs in 46.2 overs and the Black Caps attained the target by smashing 209 runs with one wicket in hand and 26 balls to spare. 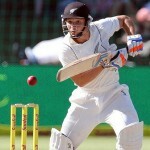 James Franklin (New Zealand) was declared ‘Player of the match’ for his brave knock. 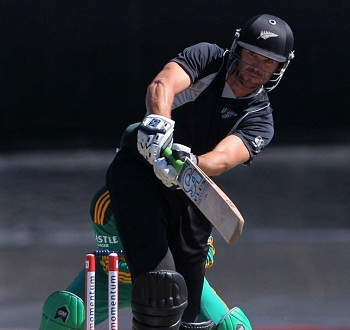 The first One Day International of the three match series was played at Boland Park, Paarl, on January 19, 2013. Earlier, Brendon McCullum, the skipper of New Zealand, won the toss and preferred to chase while sending in South Africa for batting. Hashim Amla came in to open the innings with his captain, Graeme Smith, who was dropped by Rob Nicol in the first slip off Kyle Mills in the very first over. They took the score to 25 in 4.5 overs as Amla was declared leg before wicket off Mills for 13 and two runs later, Smith was gone for seven runs in an identical fashion off Mitchell McClenaghan. AB de Villiers became the next victim of McClenghan 10 runs later for seven runs as Faf Du Plessis got together with Colin Ingram. The consolidation process was started by the two batsmen as Ingram hit 1 six and 1 four in the 17th over and du Plessis got nine runs three overs later with a four. The score was enhanced to 83 as Colin Ingram lost his wicket for 29 and the next batsman, Quinton de Kock, was dropped at eight by Martin Guptill off McClenghan in the slip at nine. Quinton de Kock did not avail the chance and was caught superbly by Nathan McCullum at mid-off on the bowling of James Franklin for 18. Ryan McLaren reached in the center next and added 2 fours in the 37th over as Faf du Plessis attained his fifth ODI fifty in the 39th. 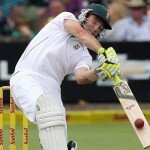 McLaren contributed 33 before he was removed and du Plessis became the eighth victim for 57 off 72 balls with 3 fours. The hosts managed 208 runs before their innings was folded back with 22 balls to spare. Mitchell McClenaghan and Kane Williamson were the highest wicket takers with four wickets each whereas Kyle Mills and James Franklin shared one wicket each. The Black Caps had a shocking beginning when Martin Guptill was unluckily run out for a duck on the second ball of the innings. 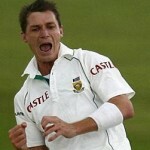 The incoming batsman, BJ Watling, was dropped two balls later by Graeme Smith in the second slip. Lonwabo Tsosobe removed Rob Nicol in the next over and Kane Williamson multiplied the worries of the visitors when he surrendered for just five runs. Brendon McCullum walked in the center next, got 2 fours in the 11th over and hit the first six of the innings in the 15th over. The fourth wicket association took the score to 73 as Brendon McCullum fell after scoring 26 runs and the Kiwis were reeling at 5-81 in 19.2 overs. BJ Watling and James Franklin did not surrender and kept on creeping until Ryan McLaren got two scalps in the 26th over. He clean bowled BJ Watling for 45 on the fourth ball and sent back Jimmy Neesham for a duck two balls later. The Black Caps were in a dismal situation after losing seven wickets for 105 runs in 25.6 runs and the match looked like slipping from their hands. Nathan McCullum took guards in a critical situation as Franklin was stranded at the other end. Nathan took off bravely by adding 11 runs in the 27th over with 2 fours and 2 more boundaries in the next few overs. The scoreboard showed 140 as McCullum was held lbw for 24 and the tail ender, Kyle Mills, replaced him. The chase was kept alive by the batsmen and they gathered 13 runs in the 37th over with 1 six and 1four. They played calculated innings and lifted the hopes for the visitors by reaching 187 in 43.1 overs as the stumps of Kyle Mills were shattered for 26. The Black Caps required 22 runs to win the match from 41 balls with just one wicket remaining when Franklin took over and dispatched 19 runs in the next two overs with 4 fours. The target was achieved by thrashing 209 runs off 45.4 overs as James Franklin remained unbeaten for 47 from 61 balls with 5 fours. Ryan McLaren was the most destructive bowler with four wickets whereas Lonwabo Tsotsobe and Rory Kleinveldt shared two wickets each. New Zealand won the thrilling encounter by one wicket against the heavyweights South Africa and leads the three match series 1-0. The second ODI of the series will be played on January 22, 2013, at De Beers Diamond Oval, Kimberley.